Need ideas for room decoration? From slow fade to sound to light, the choice is fantastic. 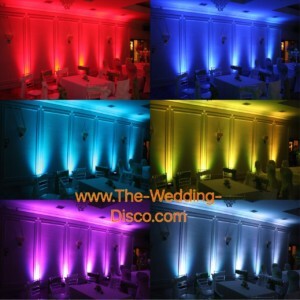 From the most Gorgeous pink, blue, green, white, red and orange, the colours will suit any theme you may have. We are currently hiring the up lighters for £15 per light. 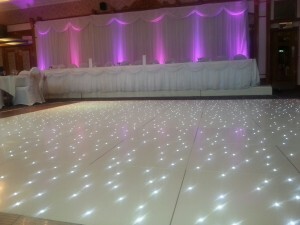 Taken with our starlite dance floor, or our starlight ceremony aisle we will reduce the cost £5 per unit. 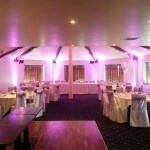 Weddings and receptions are the most popular venues to use LED Up lights. 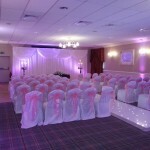 Making the venue come alive with colour to look fantastic for your big day. 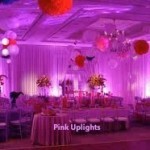 Up lights or uplighters can be used during your entire wedding event. They do not heat up and therefore are extremely safe to touch. Should any young child were to touch them by mistake. We can set them up well in advance of the wedding. 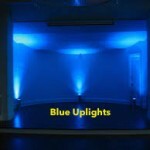 Positioning the lights to flood as much space as possible or highlighting specific areas. 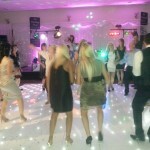 Call or Email skipalexanderdj@gmail.com now to hire LED uplighters for your wedding. 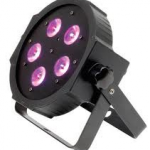 LED Up lighters are fast becoming an affordable and effective solution for any event. 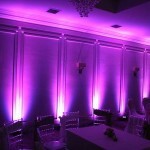 Six to Ten lights can change the colour of any room. 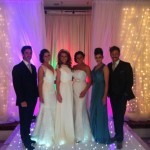 Creating a completely new and professional look for any special occasion.